By Jane Barthelemy. Is your digestion stressed even when you avoid gluten? Do you notice emotional ups and downs that could be related to diet? Yes, certain foods cross-react with gluten. This means they create adverse reactions by themselves, or they make your response to gluten even worse. You can order expensive personal tests for all your gluten cross-reactors at Cyrex Labs or TrueHealthLabs. Or you can simply observe yourself for sensitivity to these top-10 offending foods. After testing tens of thousands of people for gluten cross-reactor anti-bodies, these 10 foods came up as the most common culprits. Your digestion is unique. Does this general list apply to you? To find out, try eliminating these top 10 cross-reactors from your diet for 2 weeks and notice how you feel. You can eliminate them one at a time, or altogether as you choose. Keep a list of what you eat. Observe your body and emotions carefully, and write them down. The top 10 Gluten Cross-reactors are sugar, coffee, cow dairy, milk chocolate, potatoes and other nightshades (tomatoes, peppers, eggplant), oats, corn, rice, tapioca, GMO & refined foods. Dietary change feels daunting. However YOU can DO IT! You can enjoy delicious meals every day on your optimum personal diet. My personal journey made it necessary to eliminate ALL these cross-reactors from my food. Now my meals are homemade, healthy, and delicious. Of course I had to re-write all my own recipes. And the good news is that they’re available free online, or in my books. The secret to my success was to make one small change a week, which is not overwhelming, and adds up to big changes in your health. Sugar – The #1 top cross-reactor and metabolic scrambler in the human body. “Sugar” includes all high-carb and glycemic sweeteners such as agave, maple syrup, coconut sugar, honey, rice syrup, all refined and unrefined sugars. That’s why I use zero-carb sweeteners. (I don’t sell sweeteners, I just test them.) So far there are two healthy ones that I recommend. Just Like Sugar Table Top natural chicory root sweetener is expensive, however it tastes great and doesn’t raise blood sugar one bit. Another sweetener to consider is PureLo, Lo Han Sweetener by Swanson. Sugars increase stress levels in the body, because they make you work harder to maintain balanced blood ph. This added stress tends to increase any food intolerances. Humans love sweets. Did you know that gorillas prefer a steady diet of donuts over their normal food Perhaps we are a tiny bit like that. Sugar is addictive, activating the same brain receptors as cocaine and heroine. Food manufactures capitalize on this, and the result is that many of us have a “sugar habit”. Approximately 55% of the “sugar” used in the USA comes from GMO beets, and this creates additional digestive stress. You can free yourself of sugar dependence. Kick your habit with the help of these natural zero-sugar sweeteners. Coffee – is a common cross-reactor that can exacerbate gluten reactions. Did you know that 10% of coffee, including decaffeinated coffee, is a protein that cross reacts with gluten antibodies. So if even if you’re avoiding gluten, there is a strong likelihood that the protein in your coffee may be triggering the very same gluten reactions you’re trying to avoid. Even worse, that caffeine rush that seems to raise your energy today, slowly steals away your long-term vitality and decreases sexual libido. For a better solution that allows you to enjoy your cup of Joe, try my yummy recipe for Paleo Coffee! Cow dairy – 50% of gluten intolerant people also react to dairy. Our milk is highly refined by law in the USA. And most cows consume gmo grains. 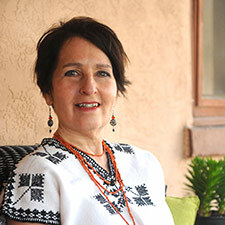 A solution for many people is goat dairy, especially fermented, such as goat yogurt and kefir. These are widely available and taste delicious. Milk chocolate with sugar. Anything that contains dairy and sugar is a cross-reactor. Even if it’s organic. Try pure unsweetened chocolate or pure cacao powder, and make your own yummy chocolate treats. 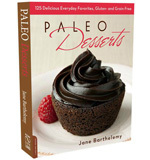 Better yet, check out my book Paleo Desserts for a whole chapter of amazing chocolate sweets. Potatoes and other nightshades such as tomatoes, peppers, eggplant. Potato flour is often touted as a healthy alternative to wheat. But these nightshades vegetables are a problem for many people, and the results can be delayed weeks or months. If you’re of Caucasian descent, it’s likely that you have difficulty digesting nightshades. That’s because they are a New World food high in saponins, natural chemicals that cause perforations, or holes in the small intestine. A perforated gut is an open invitation for auto-immune diseases and food reactions. For more details see my article Beware of Nightshades. Oats – Even gluten-free oats is questionable. Corn – A common cross-reactor. 90% of our corn is gmo. Let’s label it. Rice – This favorite gluten-free alternative is often a cross-reactor. Tapioca – Often used in gluten-free flour blends, as its texture mimics wheat. GMO foods, refined foods and chemicals, such as breakfast cereals, American cheese, artificial sweeteners. Common genetically modified foods are sugar, soy, canola, corn, zucchini, summer squash, papaya, and restaurant food. See Avoiding GMO’s? Here’s a Guide. Does this sound impossible? Not at all! Every single recipe on this website is free of these common cross-reactors. Search the recipes here. 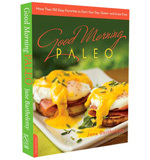 Buy my books Good Morning Paleo and Paleo Desserts for hundreds of yummy non-gmo recipes. In my healing practice, I find that many people’s so-called gluten intolerance is greatly improved when they eliminate these top 10 cross-reactors. I’ve been off them for about 5 years. In that time I’ve dropped pounds and seen a total turnaround in my health. Meanwhile I enjoy delicious, healthy meals every day. 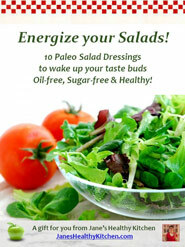 Check out the Paleo Diet, and let me know your comments.